We flew in from Saigon to Da Nang, one of Vietnam’s major ports, situated on the coast of the South China Sea. From the airport, we immediately hopped on the bus to Hoi An, stopping only at China Beach, said to be a popular destination in Da Nang during the summer time. I was not impressed. From there, we continued along a well-maintained road bordered by the ocean side and granite mountains on the other side. I noticed lots of construction activities by the ocean side, new hotels being built, including big hotel brands such as Sheraton. I also noticed what seemed to be newly planted palm trees. At the end of the highway, the road narrowed sandwiched between large expanse of rice paddies. I saw bikers around the narrow road and a few tourists taking pictures of the women planting rice and the water buffalo. But first the ancient town. Hoi An is famous for its well preserved ancient town, a UNESCO World Heritage Site. 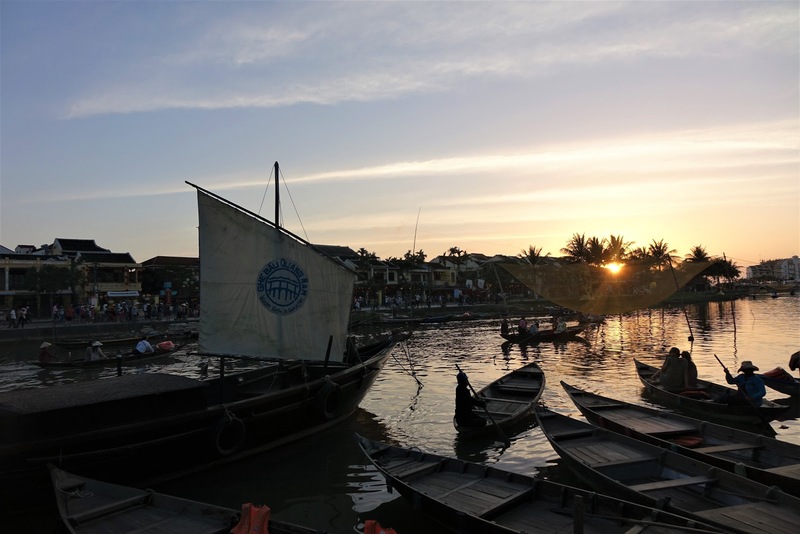 It was one of the most important trading ports in Southeast Asia in the 15th century. The ancient town was best explored by foot or bike, no cars were allowed there. 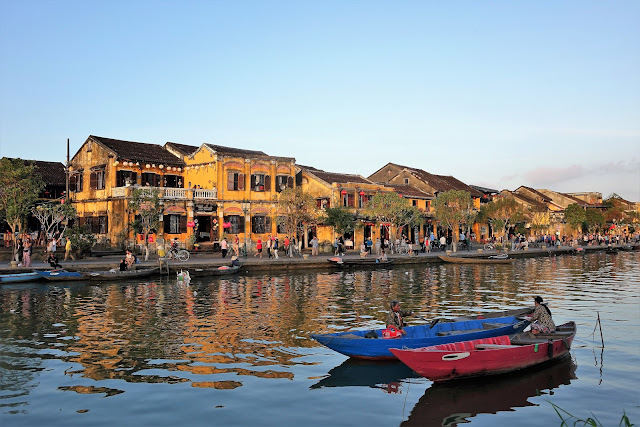 It was truly an ancient city, restored, but most of the well-built buildings like the Hoi An Assembly Hall, the 400-year-old Japanese Covered Bridge and the Ancient House, stood in their near original form, minus the restored buildings/shops selling lanterns and silk materials and souvenirs. 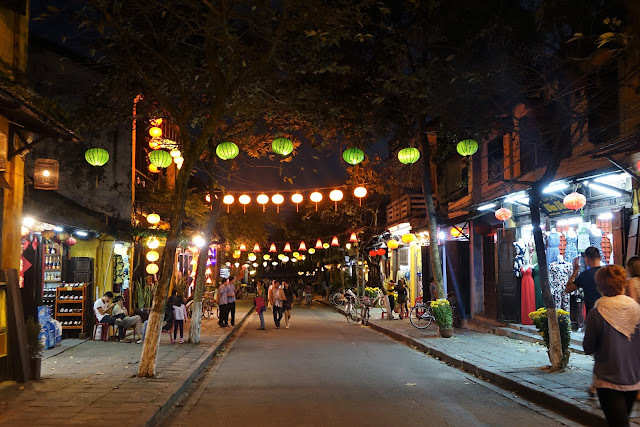 Hoi An is also famous for silk lanterns. Hanging silk lanterns were all over the place. I was among the hundreds of tourists that lingered until dark to see the ancient town in lighted lanterns. We had dinner at a local restaurant by the Japanese Covered Bridge, but as soon as we left the restaurant, I smelled whiff of delicious food emanating from the street food vendors that lined the riverbank. The riverside became alive with bright lights and street foods. There was a line of small boats (sort of gondolas) with paper lanterns, waiting to take couples under the Japanese covered bridge for a romantic picture. Hoi An is quite small. I saw most of the attractions in a day. The following day, I ventured out and joined a boat trip on the Thu Bon River. I saw some unmanned large nets supported by four poles in the up position and a couple on a small boat casting their nets. Compared to the unmanned large nets, the couple seemed to be the ‘small fish in the pond’. I didn’t know if the couple were casting their nets for tourists because our boat driver stopped and requested that they do it again so we could take pictures. 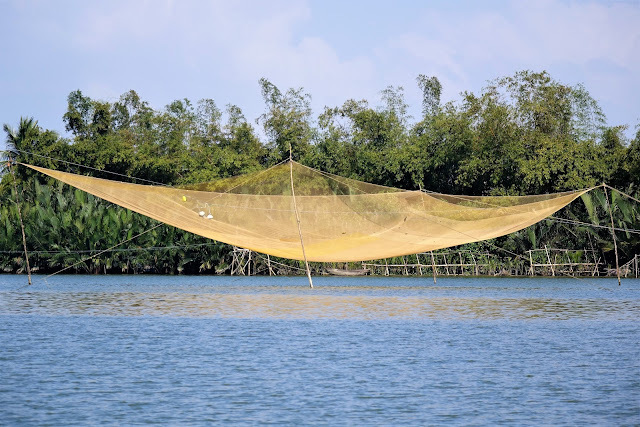 The picture of a man throwing the net into the air where it sailed out and descended into the water like a parachute, and then pulled out slowly was like an art form worthy of a page in the National Geographic magazine. But as we cruised further down the river, I saw many more large nets that lined the river. A couple of birds were trapped in one of the nets. I started to question the sustainability and environmental impact of the type of fishing method commonly used. Our boat ride ended at Kim Bong village advertised as the home of traditional woodworking and boat-building. We visited a woodworking store and a lacquer store. I did not buy anything from the woodworking and lacquer store, but I thought I contributed something to the community by buying fruits from the public market. 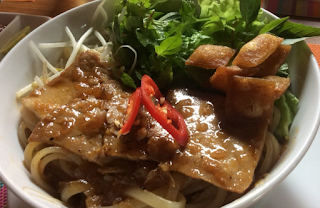 And now the real highlight of my trip to Hoi An. The culinary lesson in the Traque Organic Village was the real highlight of my trip to Hoi An. 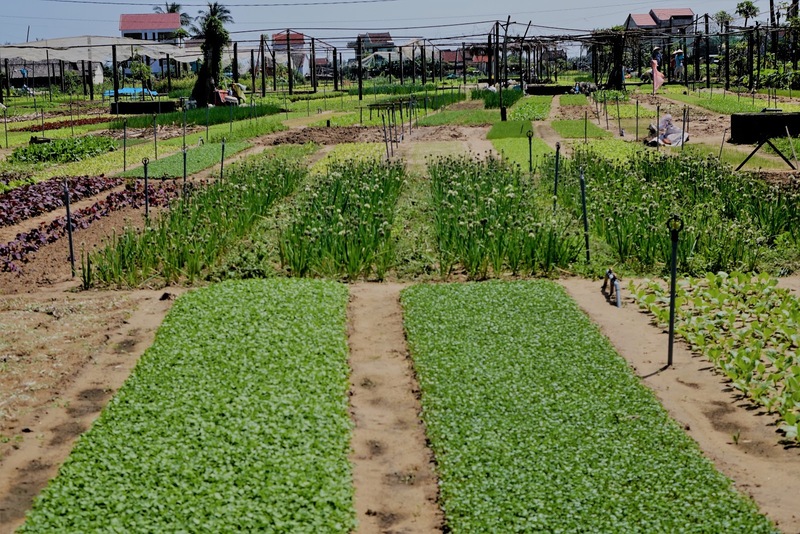 An open-air cottage surrounded by expansive vegetable gardens, housed the cooking demonstration. 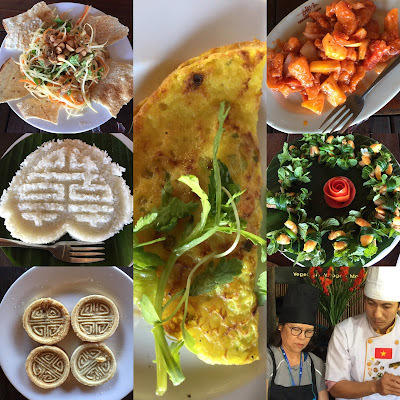 I learned how to cook Banh Xeo (Vietnamese pancake). I immediately ate what I cooked before sitting down for the seven course-meal that started with fried spring rolls and followed by the beautifully adorned shrimp with mint. Then more pancakes where I added fresh mint, basil, wasabi and other herbs from the garden. The papaya salad was a medley of spicy, sweet and sour and served with delicate and crispy rice cakes. By the time the stir-fried beef with pineapple and tomato arrived, I was already full. The not-too-sweet cookie was perfect for dessert. But everything was a fantastic burst of flavors and textures. And back to the ancient town. I was not happy with the pictures I took from the ancient town the previous day. So, I went back to take pictures of the scenery and architecture without the people (what was I thinking). 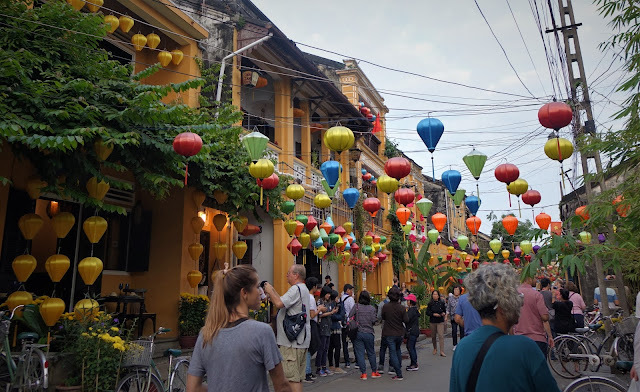 Hoi An was touristy, but it was nice. Frustrated over my unsuccessful picture-taking, I thought I would just go buy the silk lanterns from the store where our guide took us the previous day. The store was not that far from the Assembly Hall and the Japanese Covered Bridge, but I could not find it. It was easy to get lost in the ancient town. I walked long blocks and found myself in the same area of the Coffee Roastery with green lanterns. I walked around to see if I could find the same lanterns from the other stores. I left empty handed. I decided to go back to my hotel and walked towards the taxi station when I passed an urban-hip looking restaurant. I peeked inside and decided to have dinner there without knowing the name of the place. It was the Street Café. Little did I know that it was highly rated by Trip Advisor. I had the Mi Quang Noodle with pork. The food was good and reasonably priced, and the service was excellent. When I got confused over the bill (my fault for always paying in USD), the server ran to the cashier and everybody helped in sorting things out. Glad to learn that the restaurant provides training and a place to work for underprivileged and street kids. 2. I have no material connection to the restaurants, brands or products mentioned in this blog nor received any compensation for writing this post.